SpaceX's first Falcon 9 rocket is completely integrated at the Cape Canaveral Air Force Station in Florida for its launch debut in 2010. SpaceExploration Technologies (SpaceX) met its goal of having its first Falcon 9rocket in place and fully integrated at Florida?s Cape Canaveral Air Force Stationby the end of 2008. TheHawthorne, Calif.-based company mated the rocket's 17-foot (5.2-meter) payloadfairing to the Falcon 9 first stage by Dec. 30, completing integration a dayearlier than planned. 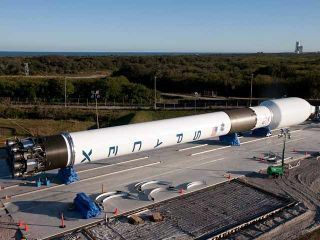 "WithFalcon 9 integrated, our focus shifts to the big launch mount anderector," SpaceX Chief Executive Elon Musk wrote in his final update of2008. "All the pieces have been delivered, and the coming days will see atremendous amount of welding to join them all together." Once the launchmount and erector are complete, Musk said, Falcon 9 will be transferred to theerector and raised vertical early this year. The medium-liftFalcon 9 rocket is a two-stage booster designed to launch SpaceX?sDragon spacecraft and other payloads from the Cape Canaveral Air Force Station?s Space Launch Complex 40 launching pad. When hoisted into verticallaunch position, the rocket will stand 180 feet (54.9 meters) tall and measuresabout 12 feet (3.6 meters) wide up to its larger diameter payload fairing. SpaceX hasfive Falcon 9 launches on its manifest for 2009, including a maiden flightsponsored by a U.S. government customer that the company will not name and twodemonstration flights under NASA's Commercial Orbital Transportation Servicesprogram. The demo flights are intended to prove that SpaceX is ready to beginmaking regular cargo runs to the International Space Station under a $1.6billion contract NASAawarded the company on Dec. 23. SpaceX achievedits firstlaunch success in September 2007 using its smaller Falcon 1 rocket afterthree failed attempts.